On Sunday, April 22nd, the Harrington's loaded up the car and headed north toward Cheongju, the current home of Daejeon's Hanwha Eagles while the home stadium is under construction. 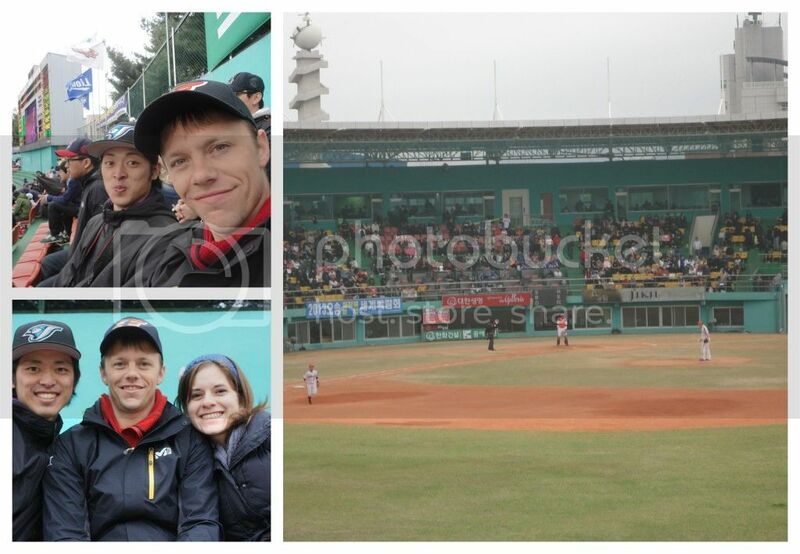 And while the Harrington's love a good game of baseball on a Sunday afternoon as much as any Apple-pie fed Americans, their main purpose in attending this specific game was due in large part to the CouchSurfer they picked up at the bus terminal before heading to Cheongju. a Japanese citizen who has a deep and unrequited love for the game of baseball and has thus become an avid Baseball tourist (already having traveled to Taiwan to watch baseball, recently enjoying Korean baseball and working out plans to watch baseball in the USA next year). So it was, the Harrington's and Waka made their way to Cheongju to watch the Samsung Lions defeat the Hanwha Eagles all underneath an overcast sky. Following the game, the Harrington's drug Waka to their single fast food weakness which isn't available in Daejeon, Subway Sandwiches. With a foot long each, the trio loaded into the Matiz and made their way back to Daejeon where Lady eagerly greeted them and they settled in for a game of chess and blog updating. The next day saw the Harrington's back to the swing of things at school and Waka getting lost in Daejeon before they all reunited in the evening for some home cooking, a visit from Aaron and more chess before saying the final round of good-nights and good-byes.